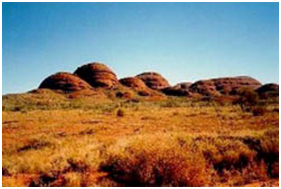 Found in the Northern Territory, the Red Centre is considered to be the physical centre spot of Australia. Viewing Uluru is considered to be an ideal activity at sunrise and sunset, when the range of colours across the red rock seems to waver and change in fascinating patterns. The Northern Territory has most illustrated the imagination of the tourists with its rugged and bright red desert at the centre of which sits the Uluru, Australia's famous icon, which is a giant stone monolith. The Red Centre is by far the most favoured of all regions in Northern Territory. With some of the finest natural scenery in the world, dating back to about 800 million years ago, the region is best known for its topographical uniqueness. The sediments of an inland sea that covered central Australia laid the basis of this topographical appearance. It is widely believed that the Aborigines have lived in this region for more than 30,000 years ago and their ancient tradition of rock painting is one of many tribal rituals still practised.